Cylindrical ear distender, coil of iron wire, Kaguru, Tanganyika, 1880-1920 (Sir Henry William Peek Collection). Cylindrical ear distender of iron wire, twisted in a spiral, Kaguru Tanganyika, East Africa, 1880-1920 (Sir Henry William Peek Collection). Iron ear distender, cylindrical, made from coiled spring, Kaguru, Tanganyika, 1880-1925 (Sir Henry William Peek Collection). Iron ear distender, cylindrical wire coil, Tanganyika, Africa, 1900-1920 (Sir Henry William Peek Collection). Louis Leakey at Olduvai Gorge. 'Dr. leakey shows Armand and Michaela Denia one of the sites in Olduvai Gorge.' Olduvai Gorge was the famous paloeanthropological location fin which the Leakeys extracted early remains that have contributed greatly to our understanding of human evolution. Copyright Frank Stuart Viner Agency. 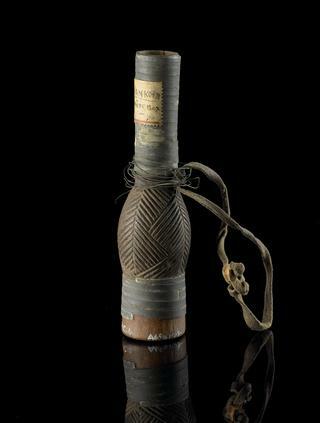 Iron ear distender, cylindrical wire coil, Tanzania, Africa, 1900-1920 (Sir Henry William Peek Collection). Iron ear distender, cylindrical, made of coiled spring, Kaguru, Tanganyika, 1890-1925 (Sir Henry William Peek Collection). Iron ear distender, cylindrical wire coil, Kaguru tribe, Tanganyika 1880-1920 (Sir Henry William Peek Collection). Cylindrical ear distender, of coiled iron wire, Kaguru, Tanganyika, East Africa, 1880-1920 (Sir Henry William Peek Collection).